I am always ready to experiment with cooking. When gal pal asked the other day if I wanted some soft shell crabs, I jumped at the chance immediately. 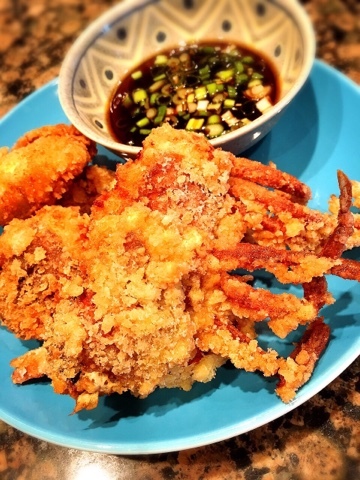 Fried soft shell crab is a dish that I almost always order when I patron Japan restaurants. The chance to try it at home is like a dream come true. I tried various methods like saute, and pan-frying. Those two ways, the result tasted fine but really nothing to write home about. The crab was soft, no crunch at all. Hub and family were supportive but I could tell they were being nice! So third time is the charm. I decided to deep fry after coating with egg wash and Japanese panko. It was super easy and fast. This time, the whole plateful was gone in a blink of an eye! Success!!! -I didn't time the frying time, I just looked at crab for readiness. It should turn red and puff up. I would estimate around 1 minute per side. Note: Oil will splatter a lot during frying so be careful! ENJOY! 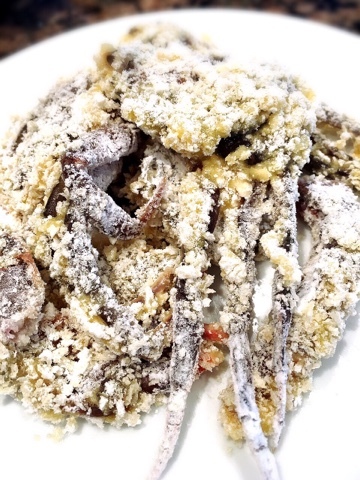 How do you like your soft shell crabs?